Unlike other ultrasonic tooth scalers that use a “jack hammer” approach to tooth scaling, the iM3 42-12 adopts a more gentle technique with its revolutionary rotational tip movement and ultrasonic removal of the plaque and calculus. The 42-12 rapidly removes calculus deposits from all tooth surfaces and is safe to use in periodontal pockets up to 13 mm deep. The 42-12 achieves a highly polished finish on the tooth with less enamel damage by using an exceptionally high ultrasonic frequency of 42,000Hz, coupled with extremely low amplitude of the titanium scaler tip’s circular movement of 0.02 mm. Lightweight handpiece with finger on/off control right where you need it, eliminating the need for a foot control. The rotational tip movement and high ultrasonic frequency create a fine coolant mist which is adjustable. Universal and Perio titanium (not stainless steel) scaling tips and spare ferrite rod supplied with the 42-12 scaler. Autoclavable handpiece and tips. Unlike other ultrasonic tooth scalers that use a “jack hammer” approach to tooth scaling, the iM3 42-12 adopts a more gentle technique with its revolutionary rotational tip movement and ultrasonic removal of the plaque and calculus. Replacement Ferrite Rod for the iM3 42-12 Scaler Tip Inserts. Autoclavable. 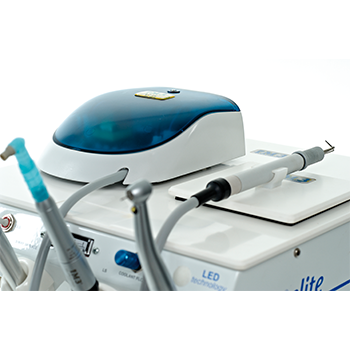 iM3 P6 LED Piezo Ultrasonic Scaler is compact in size and high in quality with a working Freq. : 30,000 Hz. The tip action is linear and the movement of the tip is used to remove plaque and calculus by physically scraping the tooth’s surface and can be used for subgingival scaling 1-2mm. The bright white LED light ring built into the end of the handpiece illuminates the working area. The P6 is foot pedal operated and comes with a built in power setting dial (1-20) that allows the power output to be set at their desired level. Both the LED handpiece and tips are autoclavable and Satelec® compatible. System includes 4 tips (BSand 1 tip wrench and connects directly to the water system of any iM3 dental machine. Pump up water tank with fittings (U2010) sold separately for standalone use. iM3 P6 Piezo Ultrasonic Scaler is compact in size and high in quality with a working Freq. : 30,000 Hz. The tip action is linear and the movement of the tip is used to remove plaque and calculus by physically scraping the tooth’s surface and can be used for subgingival scaling 1-2mm. The P6 is foot pedal operated and comes with a built in power setting dial (1-20) that allows the power output to be set at their desired level. Both the handpiece and tips are autoclavable and Satelec® compatible. System includes 4 tips (BS and 1 tip wrench) and connects directly to the water system of any iM3 dental machine. Pump up water tank with fittings (U2010) sold separately for standalone use. The Ultra LED Piezo ultrasonic scaler has been designed for use in the areas of scaling, periodontology, endodontics, and micro-preparation. The ergonomic design and light weight of the handpiece make it possible to work for longer without becoming tired. The LED allows you to work in daylight quality light and reflects the animals tooth colour exactly. The LED light remains on for 30 seconds to assist with oral examination. 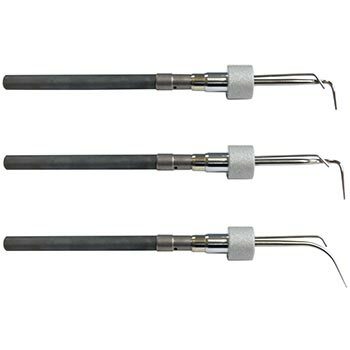 Perio (U801P) and universal (U801U) scaling tips with tip wear guides and holders supplied. Operating frequency 27-32,000 Hz. Autoclavable 135 °C, Made in Austria, 2 year warranty. The Universal scaling tip is designed for supra and sub-gingival scaling. Made from titanium and complete with ferrite rod the tip only fits the iM3 42-12 Ultrasonic scaler. Autoclavable. The Perio scaling tip is designed for supra and sub-gingival scaling. The extra length is ideal for deep pockets. 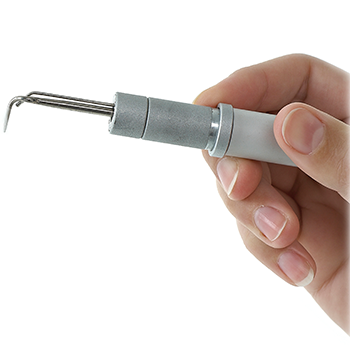 Made from titanium and complete with ferrite rod the tip only fits the iM3 42-12 Ultrasonic scaler. Autoclavable.